11 percent slower full-page renders on average, compare to normal business days. 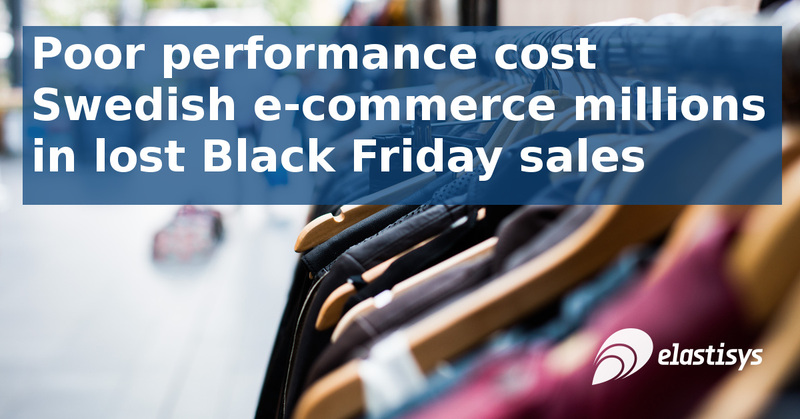 25 percent of sites loaded more than 10 percent slower than average during Black Friday. Average delay exceeded 400 milliseconds. 20 of the 89 sites were inaccessible during at least half an hour in total during Black Friday. The results are in the graph below. The normal time to fully have rendered the page is, on average, about 3 seconds. This is in itself a poor result. During the two peaks related to Black Friday, full-rendering time goes up to 4 seconds or more. That whole second is for every page view, every product page visited, which means that sites feel slow as molasses. More than a 33% increase during peak times! Mean response times for our Black Friday 2018 experiment with the most popular local and international e-commerce sites for Swedish customers. The only good thing about the graph is that it shows that apparently people are not shopping during the daytime when they are at work. Or at least not to any great extent, as performance was mostly normal. E-commerce sites that are not responding at all obviously fail at selling products. So for the 20 of 89 sites that experienced more than half an hour of downtime, the results are abysmal. But while responding at all is a necessity, it is not at all sufficient. Because slow sites are frustrating to use. And when we are frustrated, our shopping mood quickly evaporates. Amazon has found that even a 100ms increase in response time costs them 1 percent in lost sales. “Using machine learning, sites can be a step ahead in terms of performance. That way, customers are only ever met by a fully-functioning site. This is how Swedish e-commerce can reach its full potential. And that is extra important today, with increasing competition from both the East and West”, Robert continues. He is referring, of course, to both Wish.com and Amazon that are both aiming hard for the Swedish e-commerce market. Elastisys has patented predictive technology that uses machine learning to determine how much server capacity is needed. It bases its predictions on current customer demand and how much pressure they put on the site. By predicting when capacity will be insufficient and acting beforehand, customers are always met with a pleasant shopping experience. With the global giants moving in on the Swedish market, can e-commerce companies afford to not do everything in their power to treat their customers well? Contact Elastisys today to discuss how we can help you present your goods and services in the best possible way, both for the remainder of this holiday season, and for all the ones to come. We are ready. Are you?